SYNOPSIS: Although wrong-headed and a little disjointed at times this film is instantly enjoyable sleaze! 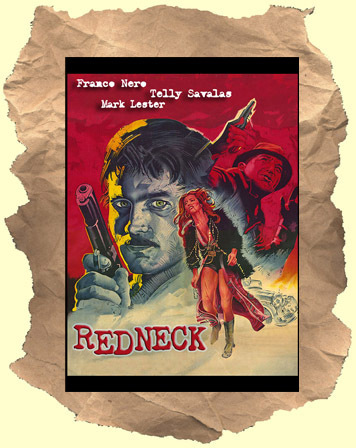 Telly Savalas (with a thick Southern twang) is the title "Redneck". He and Franco Nero star as two inept crooks who unwittingly kidnap child star Lester (Oliver). Telly has a ball as the sadistic shitheel who murders, sings, rapes, cries, and even shoots a poor three-legged dog! Before long even the proper Lester is getting off on the mayhem ("More, Sir!"). This is a recommended obscurity and a personal favorite. WIDESCREEN! *For more see: Clay Pigeon, Deadlock, Mean Dog Blues, The Intruder, Season for Assassins and What a Way to Die!